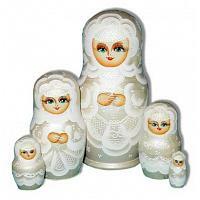 Original 7 piece matryoshka nesting doll set depicting a traditional Russian wedding. 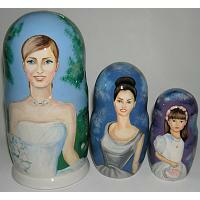 In pre-Revolution Russia, weddings were usually held in autumn (in October) and in winter before Lent, up to Shrovetide. Main rites: bridegroom sent a match-maker to bride's parents; bridegroom's parents visit bride's parents and have a talk; bride-show, where bride shows what she has made before getting engaged; "sgovor" (reaching of an agreement about future wedding); pre-wedding period usually ended in a devichnik (girl-friend's party) or the bridegroom's party - participants of the party were druzhka (a man who knew the wedding ceremony ritual well), tysyatsky (an honored member of the bridegroom's family or godfather), boyars (noblemen), other relatives; bridegroom would not get bride unless he paid ransom for her; newly-weds have to kiss in public when their guests propose a toast and cry "Gorko!" ("Bitter!") - this means that they would like the newly-weds to kiss, and they pretend they can't drink the wine without sweetening it with the kiss. Trivia: according to the Russian tradition, the bride must cry (before and at the wedding ceremony) even if she loves her bridegroom; Russian wedding laments are very poetic; after the wedding, bride could no longer wear her hair uncovered; Russians have a lot of ritual wedding songs; bride and bridegroom ride to church in separate carriages; after the marriage ceremony in church, the newly-weds go home in one carriage; parents of the newly-weds meet them at home with bread and salt and an icon, and they bless the newly-weds. 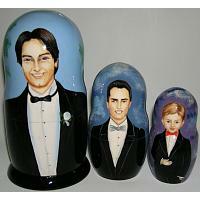 Nowadays Russian weddings follow new sets of wedding rituals. There are a lot of "Wedding Palaces" (Dvortsy brakosochetaniya) in the country. The newly-weds are congratulated by the city administration, then they visit the places of interest of their city, pay their tribute to those who perished in war, visiting the Eternal Fire. Some of the newly-weds have a marriage ceremony in church, which, however, is not obligatory (but rather optional) for official marriage registration. Height: 8" (20 cm). Production time: up to 7 business days. Ships from Moscow, Russia.